Delighted for him. Well done. The enthusiasm of youth . This should be a wake up call for some of our experienced players who takes their roles for granted sometimes. What a night for him, brilliant. Great night for him. If this doesn't bring a smile to your face I don't know what will. Van Gaal deserves credit for this. Always loved how he's given chances to so many youth players. Even putting the goals aside, his movement off the ball looks very good. Sell Rooney, give Rashford and Van Gaal who uncovered him new contracts! Chuffed to bits for him. Now will get the chance vs Arsenal. How about that for a debut. I'm more impressed with how he bursts past players though, nice showing of pace. Still chance for a hattrick tonight. Fingers crossed! That'll be coached out of him as he trains more with the first team. 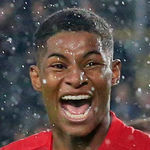 Who the hell is this kid, and why are you in the last 16 now? When is his next injury? Great debut for him. I wonder if you'll start him on Sunday if Martial is out. i was literally about to say the same thing....BTW, GET IN MEMPHIS!!! what a start. looks like an upgrade on Wilson, and younger too. I'm not one for hyperbole but he might be the greatest footballer who ever lived. Absolutely brilliant debut! Given the injuries to Rooney, Martial and Keane I think we'll be seeing more of him soon. I've been feeling fairly indifferent during most of the matches this season (personal reasons and because we've been fecking boring to watch), but his first goal fired me up for this game. This is what football is about. Fantastic stuff. I'm the first to lambast those who decry Mourinho's disuse of youth, but, damn, I don't think I cheer harder when an academy player scores. Did very well, a dream debut! Tenner says at least three tabloid papers mention Macheda in their match reports tomorrow. Cool head on his shoulders, that's for sure. Too bad he didn't take the second penalty. Could've been a hat-trick on his debut.